Desert DAWN’s Traditional Animal Processing Workshops provide students with the opportunity to learn to slaughter, skin, eviscerate, butcher and cook a medium sized animal (sheep or goat) in a traditional way, using little more than one’s knife. The methods taught are what one would use to provide meat for a family, similar to methods used on a small farm or while hunting. Softening a sheep hide for use as a sleeping mat or clothing. The workshops two primary goals are to first to help people learn ways of being in more control of the food they eat by knowing how to process an animal for food and second to encourage respect for the lives given for food by showing ways of using more of the animal for a healthier diet and for utilitarian items. Whether you are a person who is living more simply and providing more for yourself or you are a hunter who has pondered what other gifts an animal provides, this workshop will provide you skills to use as much of an animal as possible. 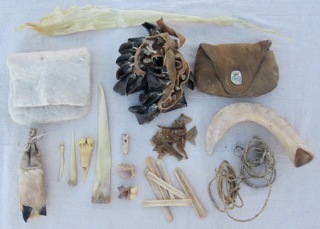 A few items that the animal provides. ➢ Make utility items including tools, glue, cordage, musical instruments, containers, adornments, clothing and more. Examples are available for students to examine and use as a guide. See more photos. The Traditional Animal Processing Workshop is the primary workshop. It is guided by the instructors with detailed explanations of every step of the process. After the instructor demonstrates a step the students share the completion of the step. The students have ample time to experience the process and ask questions. This is a two to three day workshop. Downloadable document – Animal processing steps. This document outlines the steps used in processing an animal and provides additional information regarding the topics covered in the workshop. The Traditional Animal Processing 5-day Workshop starts with the curriculum of the shorter workshop and is followed by the opportunity for the students to process an animal in small groups of four to six students. The instructor is more a coach than a guide in this segment of the workshop. The instructor is available to answer any questions and assist in the learning process, however the approach of this workshop is for the students to process an animal completely. This is a practical workshop that gives the students an understanding and ownership of the process, which comes only from hands-on learning with time to explore the process. Hosting a workshop is easy. If you are interested in hosting a workshop for your organization or the general public, please visit our Hosting a Workshop page. This extraordinary opportunity is an extended workshop that combines guided learning and coached experiential education. For more details regarding the Slickrock Gathering, please visit the Boulder Outdoor Survival School’s website at www.boss-inc.com. For more details or to register, please contact us. For more details or to register, please visit beantreefarm.com. For more details regarding Wintercount, please visit wintercountcamp.com. Registration for this workshop is the first day of the gathering. Please sign up early since the workshop typically reaches capacity very quickly. For more details regarding Rabbitstick, please visit the Backtracks site. Return to the Workshops page.